Achelous had the most liked content! Twelve people have been killed in India after a bus collided with a buffalo and careered off a bridge. If you could read properly, you would quickly realise that this is not what I am arguing. Please keep your moronic, puerile and infantile posts off this thread. Many thanks. 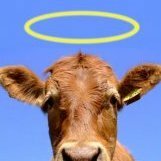 Cows are statistically more deadly to walkers than cyclists are to pedestrians, reveals the totally unbiased Cycling Weekly. 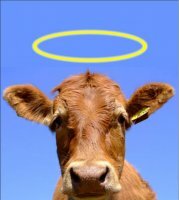 Seventy four deaths caused by cows in the UK in five years and not one of them a celebrity. At least we have this thread ready and waiting when it happens, which it surely will. Chinese tourist Chang Ming Chuang, 66, bitten and killed by an unobliging hippopotamus he was trying to photograph, at Lake Naivasha, Kenya. The Kenyan Star reports that this is the sixth hippo related fatality in the area this year. One eyed matador Juan Jose Padilla has survived his latest attack by a bull, although he did need his scalp stitching back on to his head afterwards. That's right. And this mod is watching, if not moderating. Or posting. Actually, I'm not sure what point I'm trying to make here, so may have to warn myself for going off topic. @Boudicca, don't we make a great team? Queen of the South's reserve goalkeeper injured by runaway cow. Escaped Polish cow found living with a herd of bison. Thread banished to sink slowly into obscurity. A retired Oxford University professor, as yet unnamed, is reported to have been killed by a pack of wild dogs in Greece. Staffordshire Bull Terrier eats crack cocaine and heroin, before maiming his owner to death in presence of BBC film crew making documentary on drug addiction.